That surround sound adds another dimension to your enjoyment of movies is indisputable. Problem is, it also injects a helluva lot of speaker boxes into your living space. 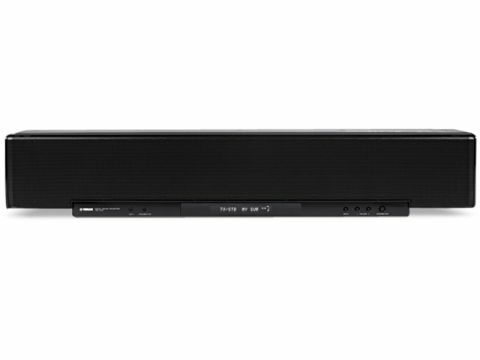 That's not always domestically acceptable, which is why Yamaha has been pre-eminent in pushing the soundbar concept - a one-box solution, with a large front-facing array of small speakers firing off sound beams in different directions, under the jurisdiction of complex digital signal processing. The £1,400 YSP-40D tops the company's current six-strong range. Some of this new model's features are borrowed from the world of AV separates - there are two 1080p24-compatible HDMI inputs, analogue-to-HDMI conversion (with 720p/1080i upscaling), a DAB tuner, 96kHz/24-bit signal-processing and 'Intellibeam' microphone-based autocalibration. Oh, and there's a fairly sensible choice of decoding modes that includes Dolby Digital, Pro-Logic II and DTS as well as the inevitable Yamaha DSPs. It's incompatible with DVD-A, SACD and the high-res soundtracks of Blu-ray, and lacks a 5.1 analogue input. Most fundamental of all to the YSP-40D are those drive units - forty 4cm 'beamers', plus two 11cm units to cover the bass and lower-midrange (which impart less directional information). Driving these is 120W of digital amplification. Don't expect floor-shaking rumbles from this unit - for real deep bass you'll also need a subwoofer; Yamaha sell a matching one (the YST-FSW100) for £180. Installing the YSP-40D is a doddle. Connect it to your display, select auto-setup from the onscreen menu, plug in the supplied mic and position it in your listening position. Then leave the room while the Intellibeam system fires off a series of test-tones, effectively 'sounding out' your room acoustics and configuring the beams accordingly. Manual tweaks are possible, but it has to be said that Yamaha's current auto-install software works so well that you probably won't need to bother. The YSP-40D does a convincing job in its five-beam (full surround) mode - so much so that on some occasions, you'll be tricked into seeking out those absent surround speakers. You can also move out of the listening position by two feet or so either way, yet still achieve an acceptable soundstage. Yamaha has certainly improved the presentation of dialogue; speech is less coloured and somehow better-defined. Indeed, the overall sound is detailed and unfatiguing. Of course, the surround effectiveness is dependent on the material being viewed. If the FX tracks are more pronounced - action movies, for example - then there's more material for the YSP-40D to draw upon in the first place.